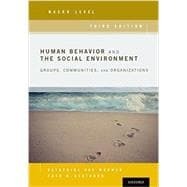 A timely revision in this global age, Human Behavior and the Social Environment, Macro Level develops a sophisticated and original view of the cultural, global, spiritual, and natural worlds that people inhabit, and explores the impact of these worlds on human behavior. An ecosystems/sustainability framework emerges as a key characteristic of contemporary practice. What is sustainable social work? What are the characteristics of a sustainable community? How is the present exploitation of environmental resources unsustainable for future generations? In accordance with the 2015 Council on Social Work Education (CSWE) standards, attention is paid to environmental justice as well as diversity and difference.